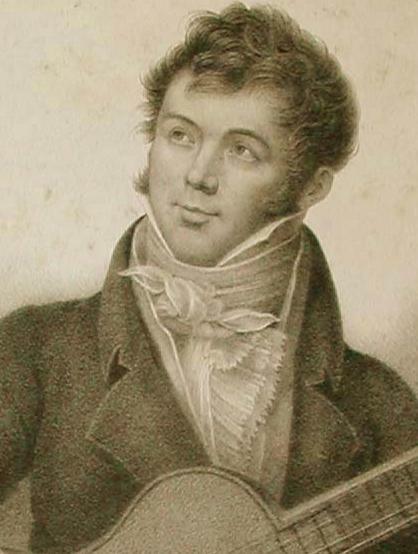 Fernando Sor was born in Barcelona and was destined to play a pivotal role in overturning the perception that the guitar was not a serious instrument. His education was designed to prepare him to follow the family tradition into a military career, but it also gave him some scope to further his obvious passion for music. His father introduced the young Fernando to opera which he loved, and also helped to indulge his fascination for the guitar. He studied for a period at a monastery in Montserrat, where he took courses in music, sang in the choir and first started to compose. However when his father died he had to leave his studies and return home. In his brief military career there were further opportunities to compose and when Napoleon invaded Spain, Sor composed a number of nationalistic songs and instrumental music in support of his native country. When the French took over the running of the country his patriotism took a questionable turn when he accepted an administrative post with the occupying forces. So when the French were finally driven out of Spain, Sor felt compelled to flee and he settled in Paris. In Paris Sor was able to concentrate on his music career and he soon built up a reputation which spread throughout Europe. That career had a number of facets as a composer, a performer and a teacher of the guitar. He toured a number of countries, spending a number of years in London before returning to Paris where he died in 1839 not long after the death of his daughter. His legacy is as a prolific composer and proponent of music for the guitar, and though the popularity of the instrument may have waned a little during the 19th century, its position today owes much to the life and work of Fernando Sor. As a guitar teacher Sor had many willing students, and he wrote a tutor for the instrument covering all aspects of playing styles and techniques which became a standard for future guitar players. Sor was a contemporary of Beethoven and has sometimes been called the "Beethoven of the Guitar". He was clearly familiar with the music of the key classical and baroque masters including Beethoven, Mozart, Haydn and Bach. Like many composers of the day he was also a skilled performer and therefore promoter of his own music. Also a contemporary of the violinist Paganini, he likewise demonstrated his virtuosity in concerts across all the countries he visited. His compositional style build upon the traditions of the recognised masters and adapted them to suit the guitar, and he demonstrated that that instrument was capable of playing similar types of music to the piano. His works incorporated a strong sense of both melody and harmony with the ability to play both melody lines and their accompaniment on the one instrument. His works understood and adapted existing forms and they also incorporated aspects of counterpoint. Although comparable to the capabilities of the piano, Sor was able to exploit the strengths of the guitar in terms of its expressiveness. Here are some sheet music suggestions for those interested in classical guitar music in general and Fernando Sor's works in particular. All the music is available from The Music Room. For those occasions when you simply want to listen to good guitar music played by the experts, here are some recommended CDs available from Amazon online stores.